Give us a call and we'll have one of our professionals dispatched to your location as soon as possible. Great company Omar Caraballo came and did a great job installing new locks to my property. I had other locksmith but caraballo was the most profesional one i dealt with. My son locked my only car key in the trunk and they were there within 15 minutes. Very polite, they gave me an estimate over the phone, and quick, reliable service. Great service, fast, unexpensive and very professional. Their keys always match my doors. You cannot compare them to Home Depot or other stores where their personnel and equipment is not specialized like theirs. Keep up the good work. I just wish they were open a little later so I can make it after work. 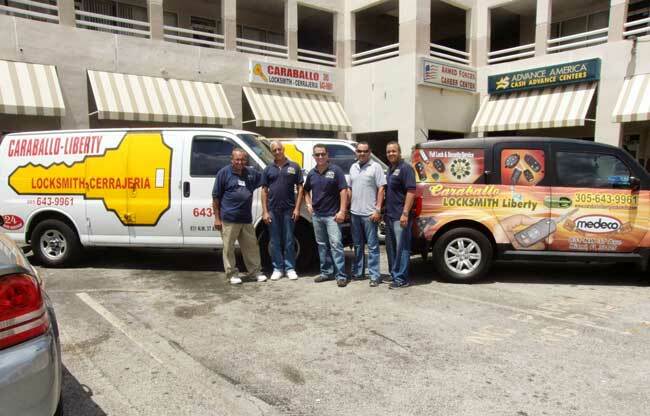 Caraballo Liberty Locksmith has decades of experience serving the Miami, FL area. Our locksmiths are experts in car lockout, residential and commercial services. We also specialize in high-security locks, security cameras and more. 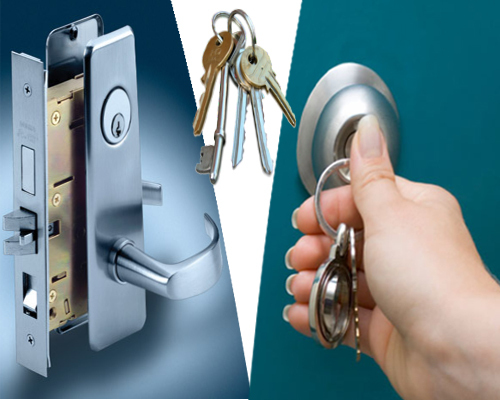 We are one of the most well-known locksmith companies in the Miami area. We provide you with a friendly experience and honest assessments so you can get high quality products and services at a great price. This type of exceptional service is what separates us from the rest. When you have a locksmith emergency, call Caraballo Liberty Locksmith for a stress-free estimate at (305) 643-9961. The Caraballo Liberty Locksmith team! When you need a locksmith for your car you can count on us to get the job done. Caraballo understands that auto locksmith services are usually needed for the fastest time frame possible. Especially when locking yourself out of your car or losing your auto keys or even breaking your car keys. We know this can be a horrifying experience. Try not to stress or feel terrible as this is very normal and can happen to the best of us. Try to maintain as calm as possible so we can move forward fast. When giving us a call have your exact location ready for faster service. Tell us your situation so we can help you as fast as possible. Call us at (305)-643-9961 if you're stuck! We provide you with all your home security needs with a trust and security assurance that you won’t get anywhere else. Your family’s security should not be left to any locksmith. Make sure you call an experienced company that's local! We know, this sounds counterproductive to offering our car lock services but we're always willing to offer great tips. Locks that are properly maintained and well-lubricated can last plenty for long years. But locks that are not cleaned and taken care of well won’t last as long. Lubricants like Tri-flow work great. Don’t ever use cooking oil to lubricate your locks. ANY hardware store will guide you in the right direction. Don’t try and force your key when trying to make it turn, you can break it and then you are going to have to call us. Instead gently move it back and force to make it turn. Make sure a family member or close friend keeps a spare of your keys. This will save you a lockout callout. One piece of advice is to use it as an accessory and keep your keys in a chain tucked under your shirt so that no one can see. Like this they won’t fall out of your pocket when you sit on a couch. If keeping them around your neck sounds too much for you, make sure at least that they are noisy. Magnetic car key holders are great to use on the metal part of your car around the top of your tire. This can save you from a Miami Caraballo service call. You might get fluster when you feel you lock yourself out of your car, but make sure you check all the doors there might be a chance one is still unlocked. 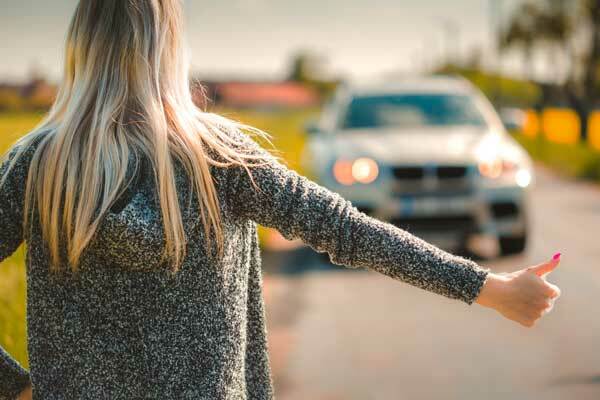 If your car has a manual lock, don't be afraid to reach out to a passerby. A good Samaritan might have a coat hanger or some sort of tool you might be able to unlock your car with. Be aware, your vehicle can be damaged if done the wrong way. For nighttime and dark rooms, glow-in-the-dark keys are a great preventive measure for losing your keys. Think about it--you drop your keys in high grass at night the glow in the dark will help. If all fails and you're in need of a locksmithing service, make sure you always keep our number (305-643-9961) in your phone. Use these tips responsibly! We don't accept responsibility for any damages. Why Caraballo for your commercial needs? Our locksmith team is composed of professionals that have invested years of preparation and pro-active involvement with cutting edge innovation in the field. 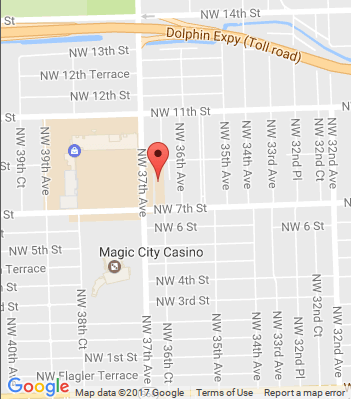 We have a trusted reputation throughout the Miami area. With your business' security being a top priority, dealing with a reputable locksmith company should be your first and only option. The variety of products in our inventory that we can make available to you is huge! We offer you everything from lock installation and repair to security cameras and access control systems. We offer free estimates, call now! Make sure you are dealing with a local locksmith in Miami Fl. You can find yourself dealing with an out of town locksmith which can cause issues if you can’t find him later on. Ask for the full legal name of the company, if they gave you a generic name like “locksmith near me” be wary and call someone else. When you go online make sure you review at least 3 websites from the first and second page of Google. 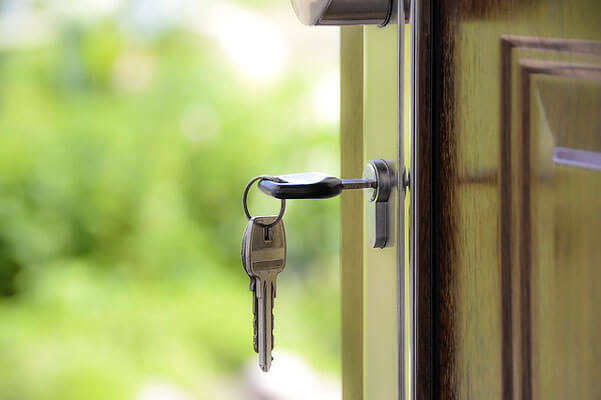 Being the first one in the search engines doesn’t necessarily mean the best locksmiths. Check out their reviews, go with someone that has great reviews on the service you need. Make sure they are licensed and insured for your protection. When the locksmith arrives, ask for I.D and business card. Verify the estimate before any work is started. If the estimate is not what they gave you on the phone, call someone else and save yourself the trouble. An experienced professional locksmith invests in their tools; if they tell you they need to break or drill you might want a different assessment. Make sure you keep their phone number after good service, to make sure you call them and don’t have to go through this again. Top 5 Locksmith Scams to Protect Yourself From! We have all have probably been scammed in one way or another. But it hurts even more when you think you are dealing with a reputable company. You feel deceived, betrayed and angry. Whether it’s a residential or a commercial locksmith that you need, we're here to cover top 15 locksmith scams. Deceiving prices over the phone. Once they get to your place and finish the job the cost is usually tripled or more of what it was agreed upon on. This bait and switch tactic is used in many services such as carpet cleaning, locksmiths’ car lock, airline tickets and more. Protect yourself by making sure you go over the price over the phone. Shop around for an exact quote. When the specialist gets there do not let him perform any work without a contract with the establish price you agreed. Making extra keys and giving them to criminals for good money. Don’t just hire anyone, make sure they are local locksmiths with a brick and mortar business for added protection. By knowing that they have a place where you can go and complain of any wrong doing you will protect yourself and can sue later if wrongdoing was done. To be fair, there are a lot of good mobile services but why take the chance? Breaking your door handle with a wrench or drilling a hole is one that’s been going on for a while. This one is usually done by rookies, inexperienced guys or thieves wanting you to pay for an expensive replacement door handle. They usually break it first and then charge you the extra door handle. The best way is to hire reputable companies that have been in business over 10 years at least. The "$19.00 emergency locksmith service" ad. This one has been going on since the beginning of Pay-Per-Click services in search engines. The problem with this ads is that they lure you into thinking you can have a lockout service for under $20 when in reality you just click on their ad cost more than that on AdWords. You know if it’s too good to be true it probably is. The reason why this happens a lot is because some of the lockout ads you see online are lead generating companies that sell them to anybody who would buy them. Usually, the companies are not related and sometimes the locksmiths are not even licensed. Often, they are just scam artists placing the ads themselves. Stealing trusted companies brand names. You got the trusted brands such as Pop-a-lock and you may end up finding a pop da lock. Sounds similar but not the same, you will end up scammed if you don’t pay attention. How websites can be built with our trusted brand by scammers trying to imitate us is outrageous in this giving age but it’s being done as we speak. The bottom line is to be diligent, ask for I.D and a licensed lock service. Make sure you got a reliable quote from a real company, do your services research Miami! 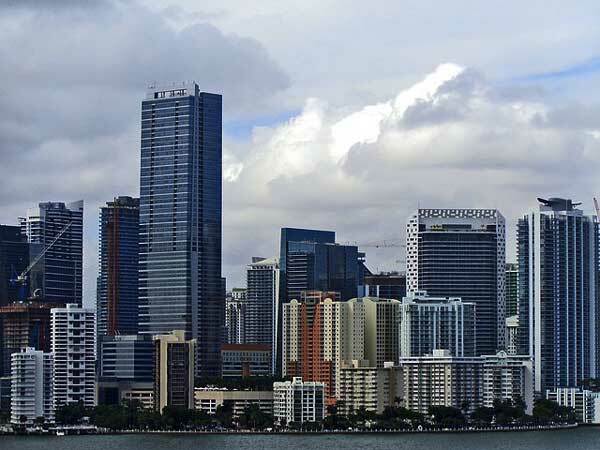 We offer security, commercial, car lockout, keys, condominiums, and 24-hour locksmith Miami Services.